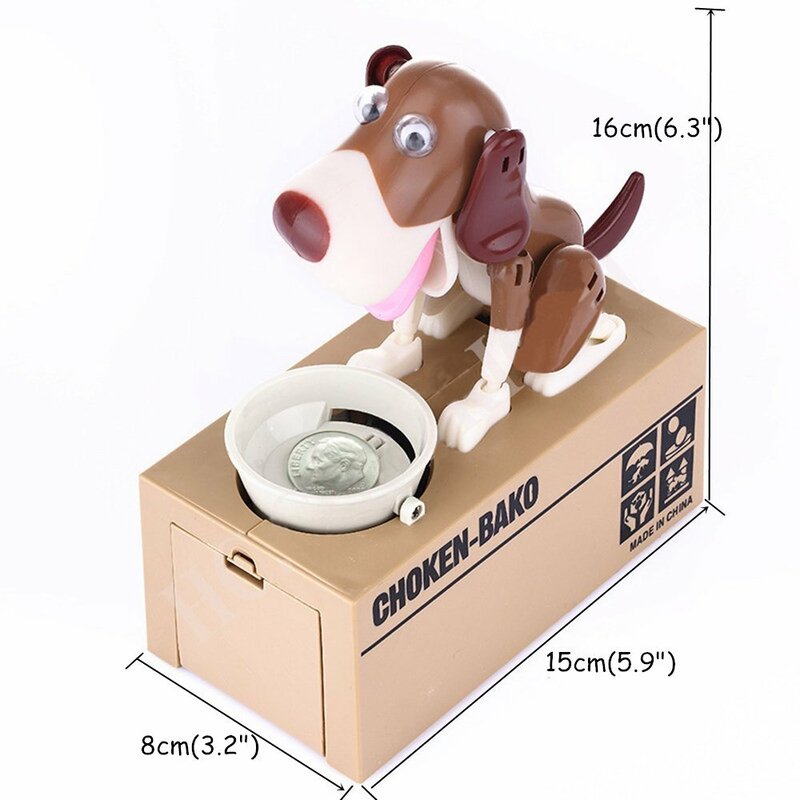 My Dog Piggy Bank Robotic Coin Munching Toy Money Box Cute Battery Operated Doggy Coin Bank... Give a Hungry Hound a Coin! This adorable puppy is happy to save your coins in his Savings Box. Place a coin onto the tray and watch as it munches away at it happily. He collects the coins you give him and stores them in his savings box. 3. They are so eager to make you save up, they will eat all of your coins! They move so realistic, you can watch them eat over and over. After place a coin in the dog's bowl and watch as the dog eats and eats until the coin disappears into the bank!!! 4. Realistic movements and accepts virtually all Coins! 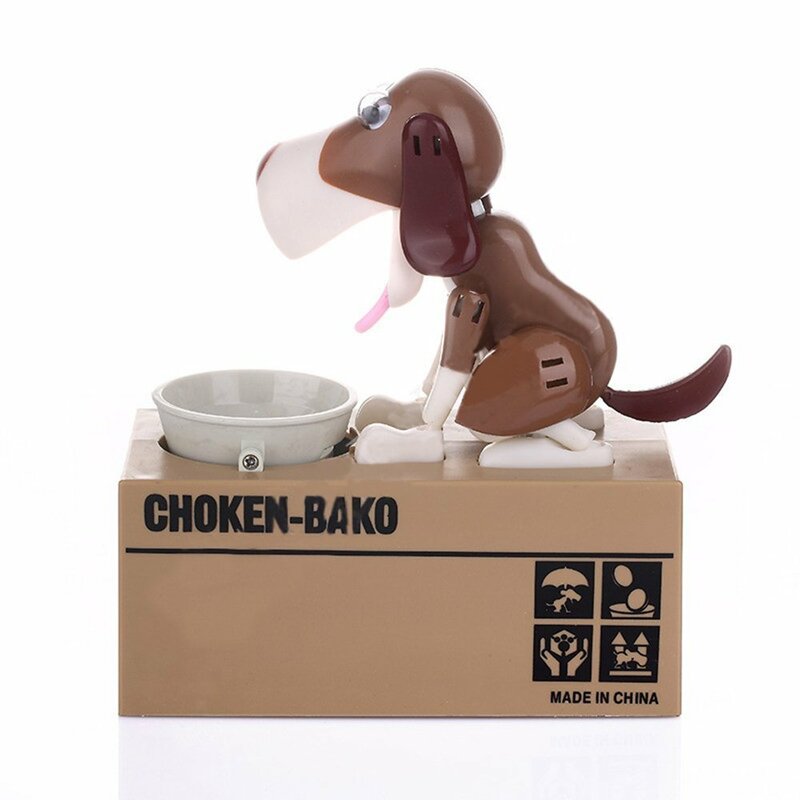 The Choken Bako bank has just about the happiest, hungriest dog you\'ll ever meet sitting on top. 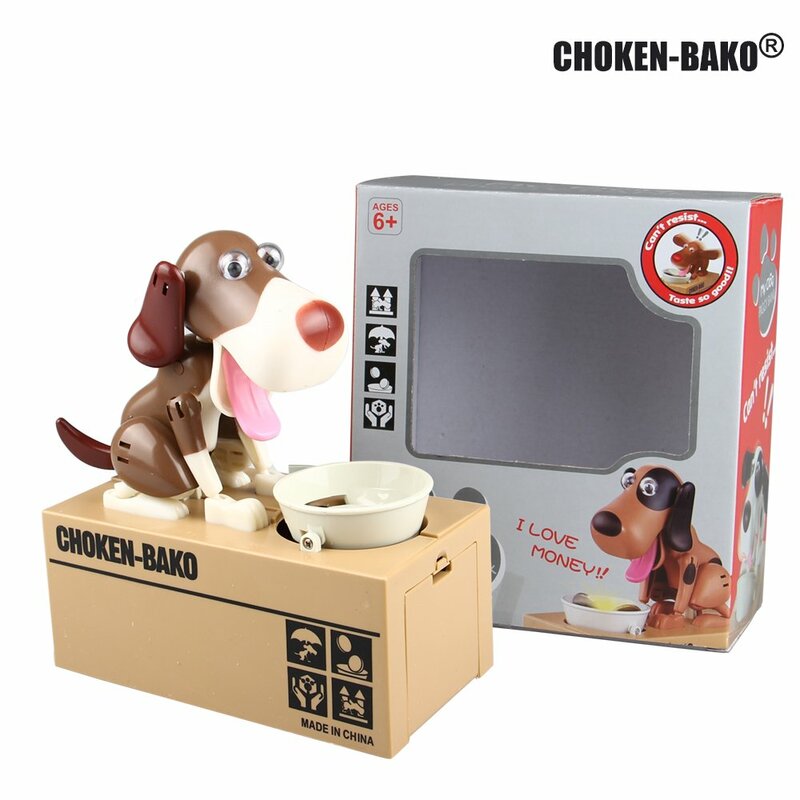 Drop some coins into his dish and he immediately goes for it, with a dog-like enthusiasm that you\'ll love. The coins are stored inside the box after he "eats" them up, making it a great way to promote savings for all ages. 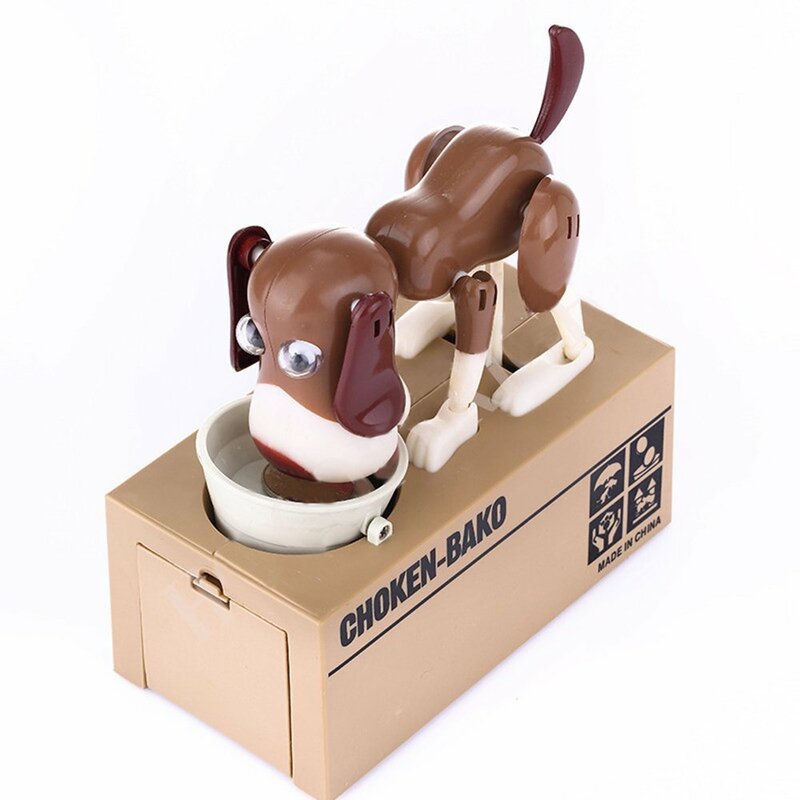 Adorable mechanical doggy coin bank. 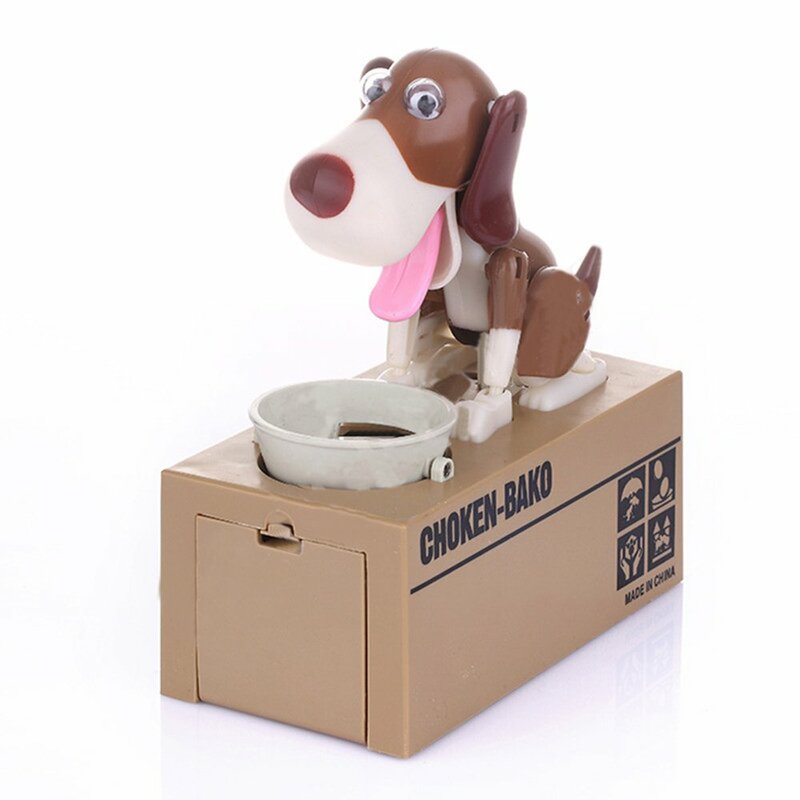 Put the coin in doggy\'s food bowl and it\'ll automatically lap it up. Watch him absolutely eat it all up! It's the funniest thing you\'ll see in a while It\'s the perfect way for you to start saving. What a fun and safe way to save money! Color: Shown as the pictures. 1. Confirm the coin outlet is closed. 2. Turn the bottom power switch to ON position. 3. Put a coin to correct position and gently press the coin, starting the program. 4. After about one second, start up procedure began to work. hard object to along with the direction of the arrow to screw the lid that can open the outlet. lid that can open or close the lid. 1. When long time not in use, please remove all the batteries. 2. This product can't suffer from impact, please handle with care. 3. The product can't close to the fire. 4. Please turn off the power when not in use. 5. Products in kind prevail.